Let's begin this tour in the city of Creston - a retreat for outdoor adventurers, foodies, creative souls and lovers of the land. Enjoy a tour, pick your own fruit, taste cheese, meet the cows, browse the art studios, view the murals, sample at the wineries and brewery. The Kunze Gallery, at the historic grain elevators along Northwest Blvd, showcases a number of emerging, established and accomplished artists. During the summer, artists are on-site using the potters wheel or hand building clay creations. A tintype photographer is there on Saturdays to take photos from 10am-2pm. You'll love the beautiful souvenir. Explore Creston's history at the Creston Museum. The museum is housed in a stone house built by a master stone mason. The Discovery Centre offers 17,000 acres of lush wetland habitat and guided tours, wildlife viewing, boardwalk strolls and an interpretive centre. A Farmers Market takes place from May to December showcasing a dynamic blend of vendors offering produce, arts & crafts and entertainment. Creston to Crawford Bay, 78 km / 48 mi north on Hwy #3A. Highway 3A is a popular touring route alongside Kootenay lake and includes a number of quaint communities: Wynndel, Sanca, Boswell, Gray Creek, Riondel and Kootenay Bay Ferry Landing. It is easily one of the most scenic stretches in Canada. Crawford Bay is home to one of the most vibrant and eclectic artisan groups in all of British Columbia. There are numerous quaint and tucked-away studios to visit. Blacksmithing, weaving, broom making, copper enameling, glass blowing, pottery; it's all here! Kootenay Lake Ferry is a free ride and also the longest in the world. Kootenay Bay to Balfour, 35 minute journey. Balfour to Nelson, 34 km / 21 mi. 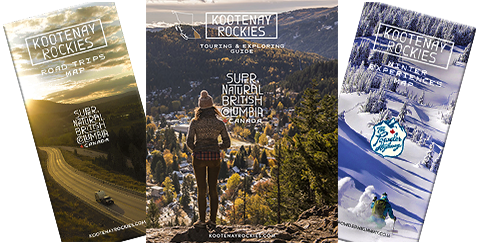 The Nelson and Kootenay Lake area is brimming with a diversity of mountain culture with a vivid past of Victorian architecture, vibrant art scenes and colourful cultural histories. Touchstones Museum of Art and History is located in a 1902 heritage building - experience the art gallery, community museum and archives. Streetcar #23 is the last survivor of Nelson's original transit system - Catch the tramway at Lakeside Park and Prestige Resort. Nelson is known as the Number One Small Arts Town in Canada. It is awash with artisan shops and studios. Many of the local crafts people sell their wares at the Farmers Market (Wed & Sat during the summer) and at annual Craft Fairs. Also throughout the summer, there is Artwalk in both Nelson and Kaslo, where local art is displayed in the downtown participating businesses. A large inventory of public art can be seen throughout Nelson, with sculptures, murals and art infrastructure created by both local and international artists. Nelson to Castlegar, 40 km / 25 mi. Castlegar is situated at the confluence of the Kootenay and Columbia Rivers and has a strong historical connection to the Doukhobors, a pacifist religious sect that fled Russia in the early 20th century. You may learn more about their culture at the Doukhobor Discovery Centre, Zuckerberg Island Heritage Park and the Station Museum. Castlegar was awarded the Sculpture Walk of Canada designation in 2014. Thirty incredible sculptures from artists across North America are installed and displayed throughout downtown. A must see! The Kooenay Gallery of Art and History is a public art gallery featuring established artists and the gift shop displays local artisan's work. During the summer, Saturday mornings, the Farmers Market takes place at the Station Museum and offers a lively blend of vendors offering produce, arts & crafts and entertainment. Wednesday evenings, bring your lawn chair to Kinnaird Park for some great musical entertainment. Castlegar back to Creston is 113 km / 70 mi. You may like to tour the nearby cities of Rossland and Trail first. Rossland has a rich mining history and the Gold Fever Follies highlight it with live musical theatre shows during the summer. Rossland is perched in the Monashee Mountains and is known today as the Mountain Biking Capital of Canada. Trail was established in the 1890s and is located on the banks of the Columbia River. Stroll downtown Trail's IncrEdible Trail and help yourself to growing fruits and vegetables in sidewalk planers. The area also has great campgrounds, swimming, canoeing, kayaking and much more. Zuckerberg Island Heritage Park in Castlegar.